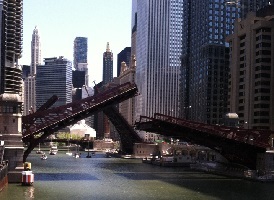 Chicago is a city of bridges. For residents it can be quite irksome when a bridge goes up just as you’re trying to walk or drive over it but from a pedestrian perspective it can be fun to watch the bridges go up. 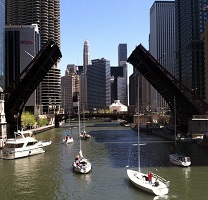 Every year in spring the bridges go up from the south to the north and then to the east as the sailboats and large cabin cruisers come out of storage and head to the harbors for the boating season. In the fall (mid-September-early November) the process reverses as all the boats move back into dry dock. Saturdays from April 20 through June 29, 2019. It’s estimated that the Van Buren bridge will go up around 9:30AM. The Van Buren bridge is #18 on this map. 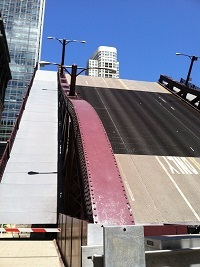 The bridges will lift in order from #18 to #1 (Lake Shore Drive). You might expect the Franklin Bridge to go up around 11:00AM. Wednesdays from April 24 through June 26, 2019. It’s estimated that the Van Buren bridge will go up around 11AM. The Van Buren bridge is #18 on this map. The bridges will lift in order from #18 to #1 (Lake Shore Drive). On a Wednesday I walked over and the Franklin Bridge (#10) went up at 12:20PM. A CDOT bridge operator team is stationed at a bridge and raises it. The boats move past to the next bridge and wait. The bridge operator team lowers the bridge and then drives to another bridge. Multiple teams are working at multiple bridges simultaneously. Each bridge lift takes 8 to 12 minutes. 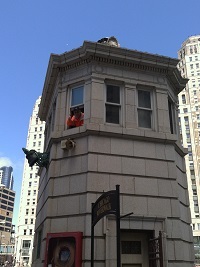 A great vantage point is along Wacker Drive or the River Walk. Grab lunch, hang out and see what happens. Or dine along the Riverwalk. 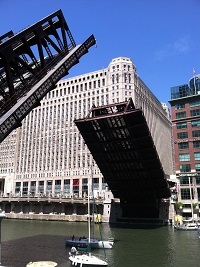 You can also watch the Michigan Avenue bridge lift from inside the McCormick Bridge House & Chicago River Museum located at 376 N. Michigan Avenue, (312) 977-0227. 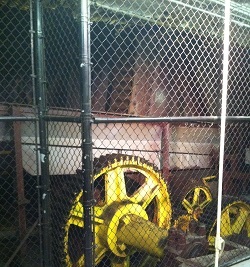 You can see the gears moving as it’s raised. The museum is free on Sundays only so you’ll have to pay the $10 entry fee per person which includes museum admission. Advance registration is required for Wednesday bridge lifts and recommended for Saturday bridge lifts. For reservations contact Joanne Dill at (312) 939-0490, ext. 23. There are no elevators within the museum. Lift times are estimated based on boat traffic so it’s hard to determine when a specific bridge will go up. Saturdays from September 22 through November 3, 2018. 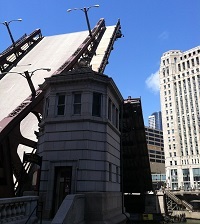 The bridges go up east to west to south starting with the Lake Shore Drive bridge at 9:00AM. The LSD bridge is #1 on this map. The bridges will lift in order from #1 to #18 (Van Buren). Wednesdays from September 26 through November 14, 2018. The Lake Shore Drive bridge will go up at 9:30AM. The LSD bridge is #1 on this map. The bridges will lift in order from #1 to #18 (Van Buren).